Our top seven elopement and destination packages range from $650 to our most lavish package at $5,500.00 Including your Smokies honeymoon. *All prices are subject to tax. *By appointment only – No walk-ins. of 10:30 AM to 4:00 PM, except where specifically mentioned for another time. *Based on one of our 5 outside garden locations, except where specifically mentioned otherwise. your guests to most packages. Just inquire about imitations and costs. additional lodging to almost any package. Just inquire about price and availability. *Picnic lunch including basket and sparkling cider for toast after ceremony. *Includes 1 night lodging at one of the Guest Suites at the Country Manor Inn. *Upgrade to include 2 nights lodging for an additional $150 or $1350 total. *Upgrade to our authentic log cabin for an additional $100 or $1450 total. in-cabin ceremonies, protected from inclement weather. *Includes gift basket of fresh whole fruits and snacks to welcome you. *Since this cabin has a hot tub, we include 2 complimentary, cozy bath robes for you to keep. the steak dinner on the third night. *Includes 2 – 6″ wedding cakes – one to eat and one to take home for your first anniversary. *Ceremony and dinner time from 5:00 – 8:00 PM, late enough to enjoy the winter starlight. light as well as indoor shots at the fireplace and on the porch and hot tub. and fall are higher priced. 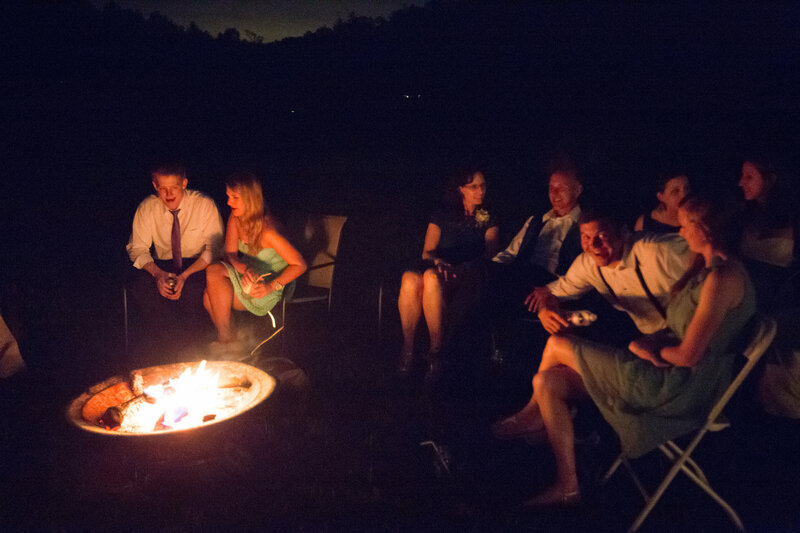 *Includes the Appalachian style party barn for ceremony and reception for up to 40 guests. *We include our black wrought iron tables and chairs. *And we add our country style centerpieces. *Two arbor choices can be set up in the barn for the ceremony (White or cedar). *We provide tea and lemonade, plus freshly popped popcorn. at the end of the evening. *Also included is a small sound system to play taped music. *We light the fire ring at dark for roasting marshmallows. *A complimentary gift of bubbles for guests to blow for your departure. menu with 2 meats and 3 sides (40 minimum count for food). *Includes your choice of a 3 piece country band or DJ for entertainment. *Includes professional photographer for one additional hour. *Includes lodging at the Hayloft Sky Cabin instead of the Honeymoon Cabin.